Experience shows that customers value sales staff who have been carefully trained to deliver product information and installation advice. Developing product knowledge and practical skills gives staff the confidence to sell more effectively, delivering tangible results. 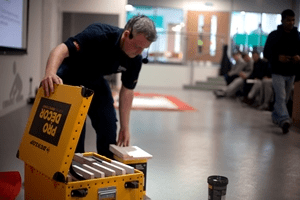 With this in mind, Dunlop, the specialist manufacturer of tile adhesives, grouts, finishing and decorating products, has launched a host of free training courses for merchants and their staff at its newly opened Innovation and Technology Centre in Stoke-on-Trent. Led by Dave Rowley, Dunlop Training Manager, and members of the company’s technical team, courses include product training, NVQ retail modules and practical workshops. “Training is a key priority at Dunlop, and we believe it is important to give merchants and their staff the opportunity to learn about our products and enhance their skills,” commented Dave. Merchants can take advantage of Dunlop’s bespoke training for retail staff, providing them with the skills and knowledge to sell adhesives, grouts and other tiling products with confidence and gain qualifications along the way. TTA Retail NVQ Material Training Programme – provides course delegates with evidence to submit for assessment towards the Tile Retail NVQ by the TTA. Bespoke Training – pick and choose modules to suit the requirements of staff from complex techniques to specific product training.